← IS THIS BARACK OBAMA’S 2ND TERM? IS IT CLINTON’S 3RD? OR IS IT REAGAN’S 9TH? (L to r) Rev. 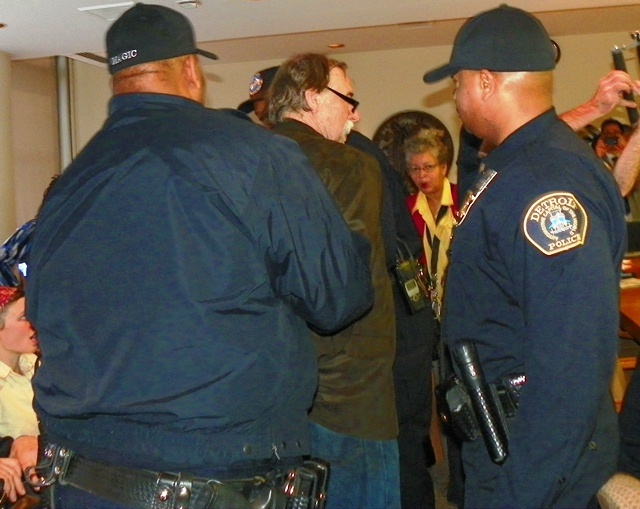 Bill Wylie-Kellerman, and Elena Herrada, both arrested at City Council April 16, 2013, with supporters, after their release from the Northeast District Police station.. Councilwoman JoAnn Watson and several attorneys intervened to have them released on personal bond. Their misdemeanor charges will be heard Wed. May 1, 2013 at 36th District Court, 8:30 a.m. 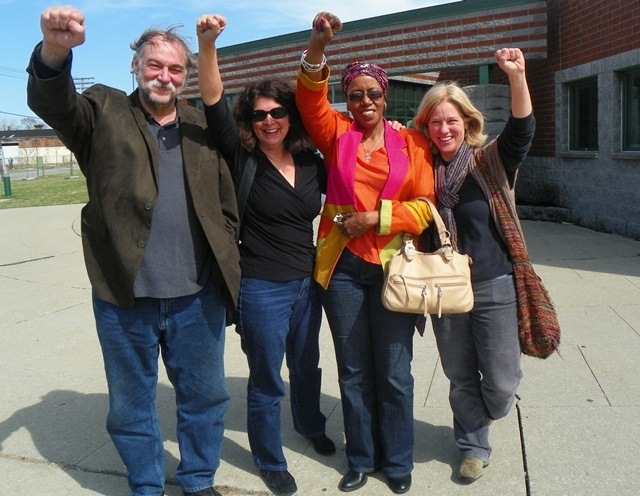 They pledged to continue the battle against the bankers’ takeover of Detroit. 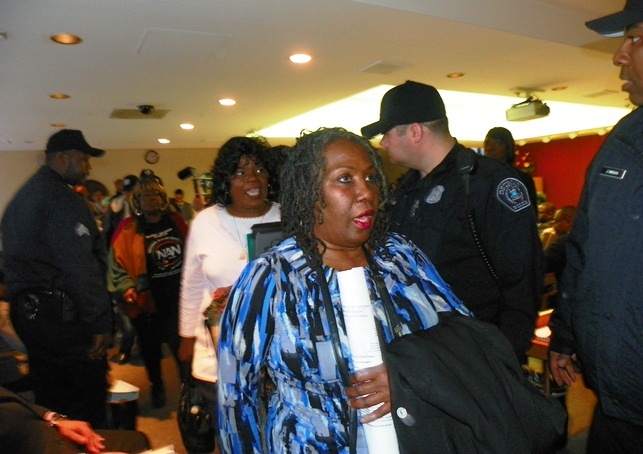 DETROIT – The Detroit City Council voted 5-2 for a “debt re-structuring” contract with the Jones Day law firm April 16, despite loud protests including civil disobedience, and legal opinions from two of three city attorneys that it represents a clear conflict of interest. Many protesters said Jones Day will enable a complete takeover of Detroit by the big banks, which the firm represents. The two were charged with misdemeanors and released at 4 p.m. from the Northeast District police station. They are to appear in 36th District Court Wed. May 1 at 8:30 a.m.
“It is common sense that the city should not be hiring the same law firm to address its debts that represents its lenders,” objected Councilwoman JoAnn Watson, who along with Councilwoman Brenda Jones voted against the contract. The PA 436 lawsuit has now been assigned to U.S. District Court Judge George Caram Steeh, an appointee of President Bill Clinton with a relatively progressive record. He has extended the time for the defendants including Gov. Rick Snyder to respond to the complaint to May 15, 2013. Antonio Cosby concurred with Watson during public comment. Jones Day partners comng to run Detroit. Managing partner is Stephen Brogan at left. Orr will directly supervise five highly-paid Jones Day partners, including his former boss, Jones Day managing partner Stephen Brogan. In a letter to Mayor Dave Bing attached to the contract, Brogan said he wanted to “clear up any doubt” that more work would be required. He said that would include asset dispositions, privatization, new debt instruments, and new labor contracts, among other issues. He also cited the city’s Pension Obligation Certificate debt to Jones Day clients UBS AG and SBS Financial, which now amounts to over $2.5 billion including penalties. Howe went on to say that Orr will imminently announce the takeover of the City’s Planning and Development Department by the Detroit Economic Growth Corporation, a “quasi-public” entity dominated by corporate board members, a move cited in the Consent Agreement. The takeover would likely mean the elimination of PD&D city workers, and would affect the city’s administration of $150 million in federal funds allotted annually, including $33.3 million in Community Development Block Grants (CDBG) and $93.1 million for Neighborhood Stabilization programs. 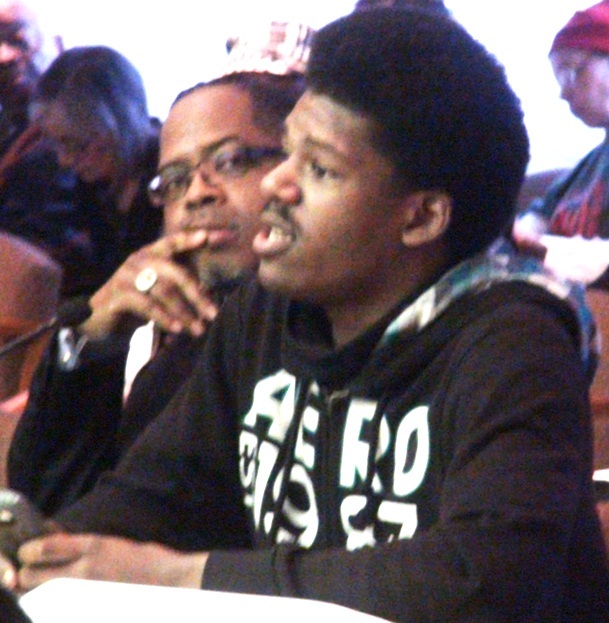 Young Detroit Buliders at CDBG hearing in 2010. Their CDBG funds were later eliminated; more groups stand to lose under EM. Howe added that other departments using federal dollars will also be targeted. The city has already divested itself of the Health and Wellness, Human Services, and Workforce Development Departments, including their workers and contractors. The majority of funding for those departments came from the federal government. Acting Detroit Corporation Counsel Edward Keelean said at the hearing that he has absolute confidence that Jones Day is ethical and will disclose all conflicts of interest. He said the state of Michigan gave the nod to Orr as EM, and that there was a meeting in January at Metro Airport between Orr, other Jones Day partners, and government officials. He said that the Miller Buckfire law firm, now on contract with the city as its “investment banker,” vetted Jones Day and other firms. Former Corp. Counsel Krystal Crittendon agreed with Law Dept. atty. Louis Smith that Jones Day contract is a “conflict of interest” during interview after City Council session Aprili 16, 2013. Miller Buckfire has been bought out by Stiffel Financial, which has had numerous lawsuits for fraud brought against it by municipalities and the Securities Exchange Commission. Law Department attorney Louis Smith, who worked closely with previous Corporation Counsel and now Mayoral candidate Krystal Crittendon, disagreed with Keelean. Councilwoman Brenda Jones said the firm had falsely claimed to represent three governmental entities in bankruptcy proceedings, Orange County and the City of Stockton in California, and Jefferson County, Alabama. She said that in fact it represented only one government, and its attorneys represented creditors in the other two cases. 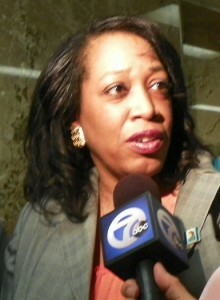 Keelean claimed that the attorneys in those cases were not working for Jones Day at the time. Council Pres. Pro-tem Gary Brown and Pres. 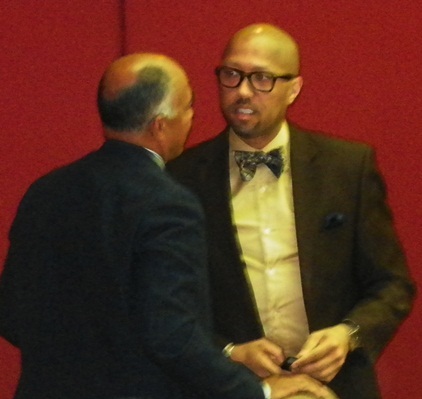 Charles Pugh confer after recess of Council April 16, 2013. The five Council members voting for the contract were Council Pres. 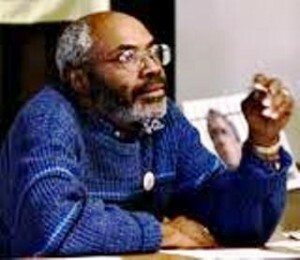 Charles Pugh, Pres. Pres. Pro-tem Gary Brown, Councilwoman Saunteel Jenkins, and Councilmen James Tate and Andre Spivey. Councilmen Kwame Kenyatta and Kenneth Cockrel, Jr. were not present. The five members clearly had their minds made up, moving almost immediately for a vote with little discussion other than comments from Watson and Jones. Earlier, Orr met with each Council member individually. Only Councilwoman JoAnn Watson took a representative with her, Attorney Jerry Goldberg of the Moratorium NOW! Coalition. During public comment at the meeting, Goldberg called for a moratorium on payment of the city’s $16.9 billion debt to the banks. Both announced that a “People’s Assembly to Save Detroit” will be held Sat. 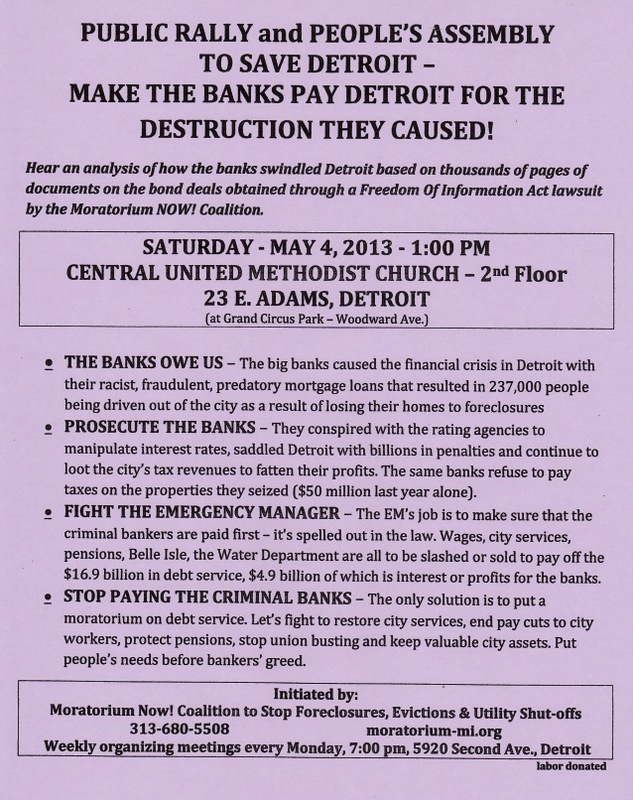 May 4 at 1 p.m. at Central United Methodist Church, Woodward and E. Adams in downtown Detroit. 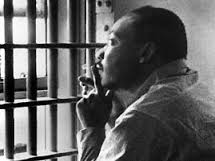 Dr. Martin Luther King in Birmingham jail. 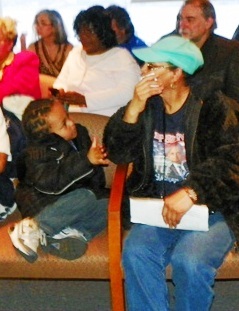 City retiree Ms. Jackson at meeting with grandson. Ms. Jackson kept speaking despite a police officer coming to her side threateningly, after Pugh told her her time was up. Rev. 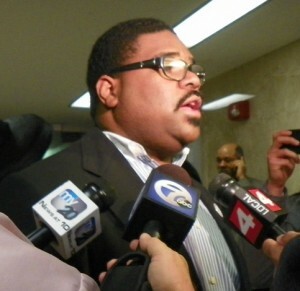 Charles Williams II interviewed after City Council meeting April 16, 2013. NAN is building for a mass march down Woodward Ave. on June 22, honoring the 50th anniversary of Dr. Martin Luther King, Jr.’s march in Detroit in 1963, where he first gave his famous “I Have a Dream” speech. The NAN march is to focus on the disenfranchisement of the majority of Blacks in Michigan, as well as the fight against the banks. For more information on that, call 313-355-2150 or text 313-492-6774. This entry was posted in Uncategorized and tagged Save. Bookmark the permalink. If we unite , nothing can stop us! This is just a basic understanding that you cannot appoint to address its debt that represents its lenders. I watched the Council session on channel 10 and I loved the passion of the people that protested against council members agreeing to the Jones Day contract. When I heard them sing “We shall not be moved” and saw Charles Pugh slam down the gavel, I had to laugh. Good job to all the took time out to protest. The 5 council members that voted for it should be ashamed of themselves. What a despicable way to brown nose to prevent yourself from being reduced to a part-time puppet. Thank you JoAnn Watson and Brenda Jones for seeing the conflict of interest and voting against the agreement.